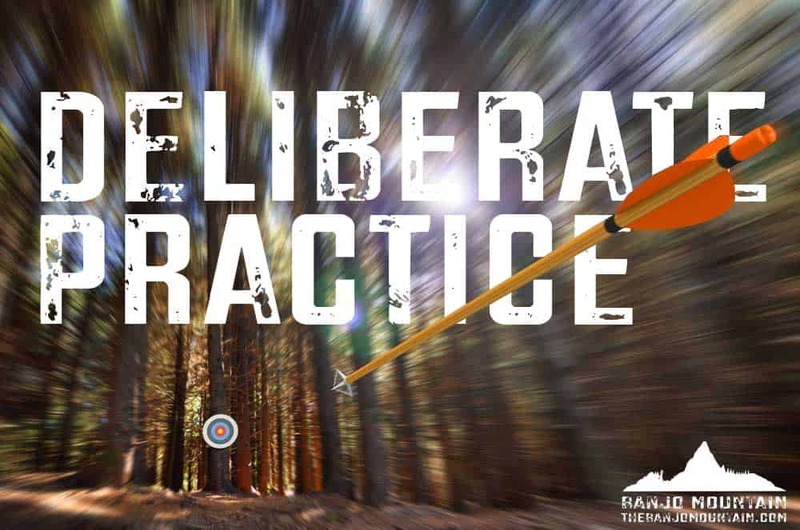 While arguments may differ as to the best way to practice, the surest way to yield consistent results in any practice regimen is to engage in what I call “deliberate” practice. Deliberate practice means mindful practice. It means practicing with a specific goal in mind every time we pick up our banjo. For example, working on straightening out your rhythm on a particular song might be your goal for an upcoming practice session. Deliberate practice means practicing with focused and exacting attention to our playing at ALL times. It means being willing to problem solve if the music we’re making doesn’t match the music we hear in our head (e.g. why does that D7 chord sound a little muffled every time we play it? — Figure it out!). Deliberate practice does NOT mean practicing while watching TV, carrying on a conversation, listening to talk radio or your favorite podcast. Regardless of how many minutes a day you’re able to squeeze in, if you’re engaged in deliberate practice every time you pick up your banjo, you’ll see quicker results than you would while practicing during the commercial breaks of your favorite sit-com. I guarantee it.